There is a small possibility that Convertize can affect the speed of your website. In order to monitor this we recommend you run a loading time test before and after installing the pixel. 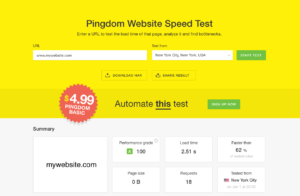 To do this, go to pingdom.com, enter your website URL and click on “Start Test”. We recommend you run more than 1 test, as many different things can affect the result. For a more accurate measure, run several tests and take the average.